It’s 2:48 am. I’ve just recently reached the comforts of my apartment after a lengthy work session in the computer lab with Ryan. I try to avoid posting at this hour of the morning, because I tend to be less than coherent, but I think the jubilation of this moment calls for an exception. We have a semester project in ECE 551: Digital System Design & Synthesis (aka “Verilog”). The project was assigned in the vicinity of a week or two before Spring Break. That is, we have had in the neighborhood of a month or more to work on it. Of course, we didn’t complete any work at all until we were required to implement one subcomponent for a homework assignment a week ago. So we completed that 2 hours before the deadline, and handed it in. No big deal. Now tomorrow the initial draft of our project report is due. Initial “draft”, as in: feature-complete implementation of all components, including explanations of how they work, timing and space analysis, and testing to demonstrate their correctness. As of 2:15pm today, Ryan and I had completed exactly 1 major subcomponent, for the aforementioned homework assignment. Less than 12 hours later, including a break for Subway, we were done. There will certainly be things that we need to tune up and optimize for the final report, but every major component of our processor is complete, in place, working perfectly, and passing every test case. All in less than 12 hours, less than a day before it is due. Who ever said procrastinators never make it anywhere in this world? …And now I need some sleep. Badly. This entry was posted in School on April 26, 2007 by ColinM. This entry was posted in Moblog on April 23, 2007 by ColinM. The angle is a little sub-par, but: this is the base of a 30-foot tower full of water. The water is supposed to come out the top. The base has a tap for a garden hose. That tap is pictured here. That tap is closed. Water is coming out anyway. Fast. :-(. This entry was posted in Maquina, Moblog, Oops on April 21, 2007 by ColinM. This entry was posted in Maquina, Moblog on April 21, 2007 by ColinM. There’s something awry in the world. It feels like we see the former every day. 183 killed in 4 Baghdad blasts. Did you even react to reading that? Or dismiss it, inconsequential? One hundred eighty-three people. In one day. I don’t know if repeating it in any other form can any further impress the number. People with plans, people with friends, people with families. What a pointless argument. I don’t mean to play a numbers game, or in any way downplay the events in Virginia, but seriously. The people killed daily in Iraq and other places of violence, unrest, and war around the world are often perfectly innocent people just living their lives. Why, they don’t even have to be in college! They could be sitting in their homes, walking to work, or any number of things that every person on the planet does daily. Why is it so much more shocking to hear of 32 slain by a suicidal gunman than 183 slain by bombs? Why isn’t it more disturbing that we are not shocked to hear of 183 slain by bombs? Did you even remember the 183 from the start of this post? Or have you already forgotten them, too? This entry was posted in World on April 19, 2007 by ColinM. This entry was posted in Madison, Moblog on April 16, 2007 by ColinM. Jared, who was pretty impressed by seeing the beautiful side of Madison for the first time. (As compared to our much more concrete-heavy campus) I hadn’t been here in years, myself. I think since a scholarship banquet senior year of highschool. What a shame to live so close to a place like this and not go see it more often! It’s really nice though- a lot of fun to play with! This entry was posted in Moblog on April 15, 2007 by ColinM. 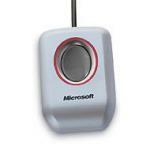 This past summer at my internship I picked up a Microsoft Fingerprint Reader on a whim. I had been reading about efforts to write an open source driver for it, and thought it might interesting to give it a shot. I haven’t actually run Linux on my desktop since then, but I finally got around to opening the fingerprint reader up a couple weeks ago and playing with it on Windows Vista. The one absolute show-stopper, though, was that it didn’t work with Firefox. Game over. All browser wars aside, at the end of the day I use Firefox for most of my web browsing, and if the fingerprint reader didn’t work with it, it wasn’t of much use to me beyond logging in to Windows Vista automatically. 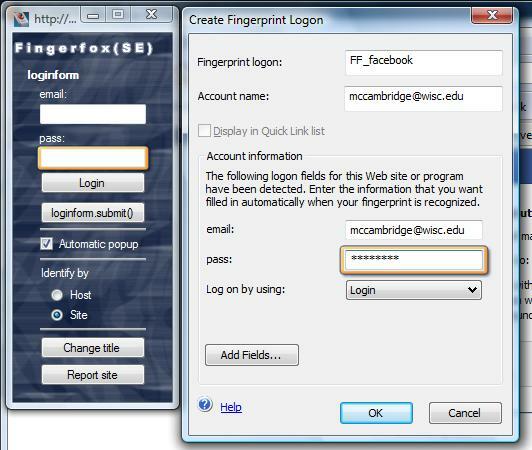 Enter Fingerfox (SE) v2, released just this weekend with compatibility for Windows Vista and Digital Persona Password Manager 2.0 (the software included with the fingerprint reader). 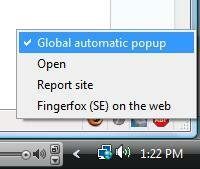 I had been waiting & hoping for this plugin for weeks, as the previous versions of Fingerfox didn’t work at all for me. I’m happy to say that today everything works! Install the device as indicated in the instructions, or by downloading the newest driver from Microsoft. This process will walk you through registering your fingerprints. Restart Firefox to complete the installation, if you haven’t. 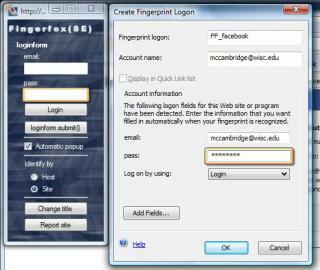 Fingerfox will pop up a small window containing the same input boxes as the login page. Do not fill them in. These are here because the Digital Persona software, which cannot detect the login page under Firefox, can detect this mini login window. 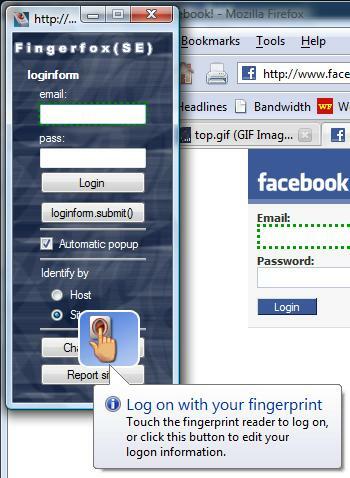 Now, press your finger on the reader to login, and you should be at your Facebook homepage! That’s it! To login to Facebook in the future, just go to the page, and repeat from step 12! For some websites (like Facebook) you will need to set up more than one login. This is because when you go to www.facebook.com, you are logging in to a different site (as far as Fingerfox is concerned) than when Facebook asks you to log in to, e.g., wisc.facebook.com. Since these appear to be different sites, you will have to store your login information twice. After that, however, it will be all set. 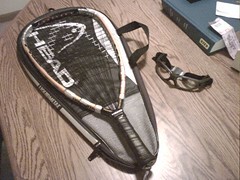 This entry was posted in Hardware, Howto, Vista on April 15, 2007 by ColinM.